Recharge you Jio connection on PayTm and get instant Rs. 10 cashback on Rs. 99 & Rs. 30 off on Rs. 303, Rs. 499, Rs. 999, Rs. 1999, Rs. 4999 & Rs. 9999 plan. How to get Recharge & Bill Payment 2% Cashback? Use Promo code JIOPRIME to get Rs. 10 cashback on Rs. 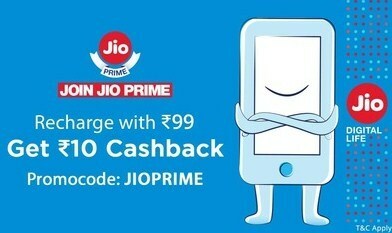 99+ or PAYTMJIO to get Rs. 30 off (Can be used twice).